October is the international Breast Cancer Awareness month. 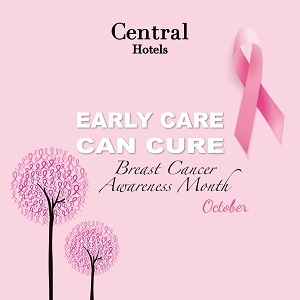 In their bid to support the campaign First Central Hotel Suites, Royal Central Hotel The Palm and Canal Central Hotel Business Bay are organising various activities across the properties throughout the month to spread awareness about the illness. Every 19 seconds, somewhere in the world, a woman is diagnosed with breast cancer. Mortality rates have decreased 39% since the late 1980s, five-year survival rates are better than 90% with early detection, and treatments and surgical techniques have improved dramatically. Today patients and survivors can live a better and healthier life due to the development of the latest treatments and therapies.